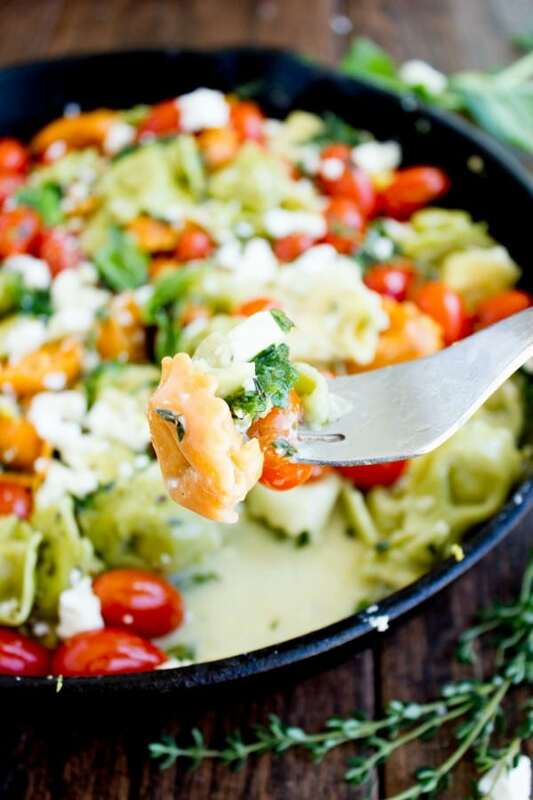 This perfect 10 minute Greek cheese tortellini recipe is a simple, last-minute lunch or dinner you can whip up in 10 minutes! Loaded with garlic, herbs, feta cheese, tomatoes, and lemon zest—it’s a burst of flavor and freshness. 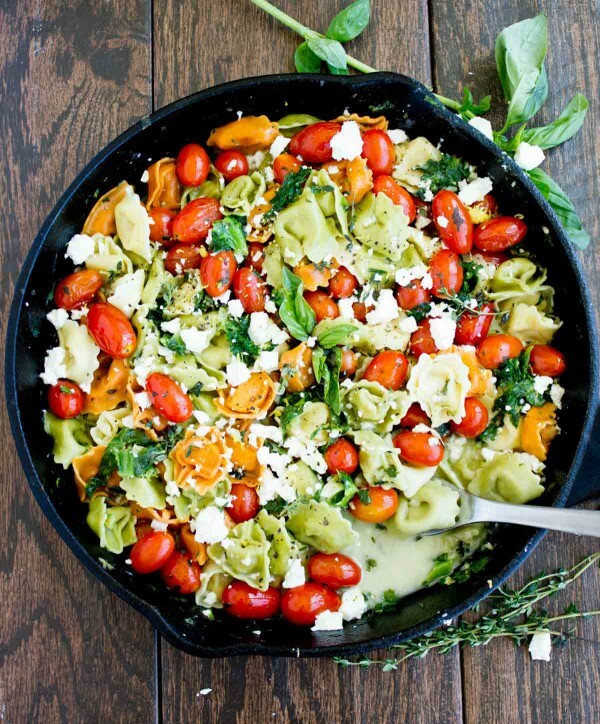 Use whatever veggie you have on hand, grab any herb and cheese combo you like, and give this simple cheese tortellini recipe a try. This is such an easy, delicious pasta dinner recipe that happens to be super quick as a bonus. There’s some comfort and cozy feel to pasta dinners. Maybe because we’ve had so many of them over the years. Or because they’re so versatile and can be made endless ways. So, this 10 minute Greek feta cheese tortellini not only satisfies pasta cravings, but it also adds such a fresh feel to pasta. This recipe starts by boiling the cheese tortellini. In the meantime, I sauté garlic, baby tomatoes, plenty of fresh herbs and lemon zest in olive oil for a few minutes. Then the half-cooked tortellini noodles are added in this fragrant garlic herb mixture. The secret ingredient to making this creamy looking sauce is—pasta water. Yes, the same water the tortellini were cooked in, just remove a cup of that salty starchy water. And start by adding 1/4 cup of water at a time while tossing the pasta continuously. Finally, add a little feta cheese and stir to melt in the sauce. The beauty of the pasta sauce in this cheese tortellini recipe is that it’s actually quite self-made. The starchy water will thicken up with the feta, lemon, and herbs creating a fresh sauce which beautifully compliments the pasta. To cook the tortellini perfectly, we let them simmer for a couple of minutes in that delicious feta sauce. This adds much much flavor to the pasta as it soaks up all the garlic, herbs, lemon and feta. It also allows for the sauce to thicken up and blend well. All you need now is to finish it off with a few crumbles of feta cheese, some extra fresh herbs and voila! If you’re less enthusiastic about feta, you can substitute any other cheese you love. Feel free to throw in some asparagus, onions, mushrooms and any veggie you have on hand. If you’re not a lemon lover, by all means, leave it out. In a large pot of boiling water, add 1/2 Tablespoon of salt and start cooking the tortellini. In another skillet over medium heat. Add the olive oil and start sautéing the garlic and tomatoes for 1 minute. Then add in the lemon zest and half of the fresh herbs. Sauté them for another minute. Remove the tortellini from the boiling water and reserve a cup of that cooking water, set it aside. Toss the tortellini with the garlic tomato mixture and add in 1/4 cup of the pasta cooking water. Lower the heat so that the water is simmering, but not boiling vigorously. Season the pasta with a pinch of salt and pepper. Add in a few crumbles of feta (about half the amount) and gently toss the pasta together. If you feel the pasta is dry, keep adding the pasta cooking water 1/4 cup at a time and allow it to cook over low heat to thicken up. The sauce should be ready in no longer than 3 minutes, and the pasta should be fully cooked. At that point, turn off the heat, sprinkle the remaining extra herbs, lemon juice and feta cheese on the top and serve. 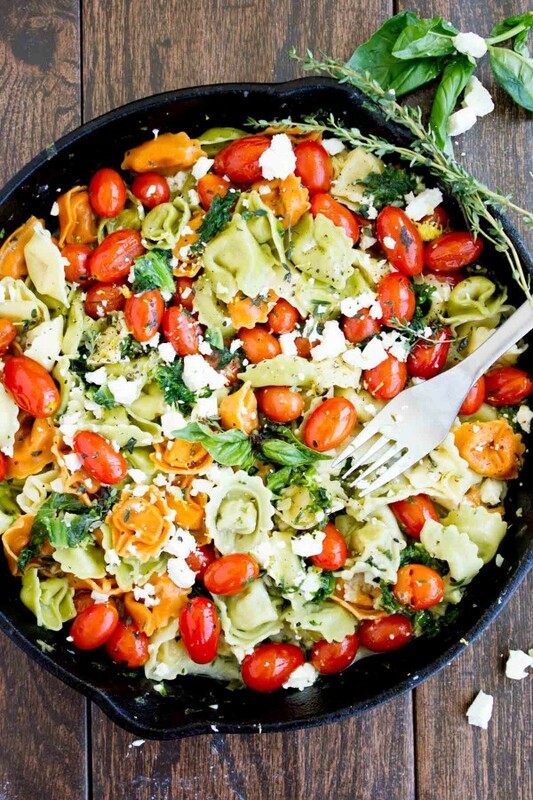 I love 10 minute recipes, your tortellinis look amazing too! The colours are so vibrant and beautiful, so crazily appetising!! i need to be eating this right now! What an amazing recipe. so many great flavors, and who does’t love tortellini? Yum!! Love this cheese torellini, my kids love it, I like that you made it colorful with tomato and flavorful with tons of flavor from herbs too. A 10 minutes recipe with a nice topping of feta!? I am in. 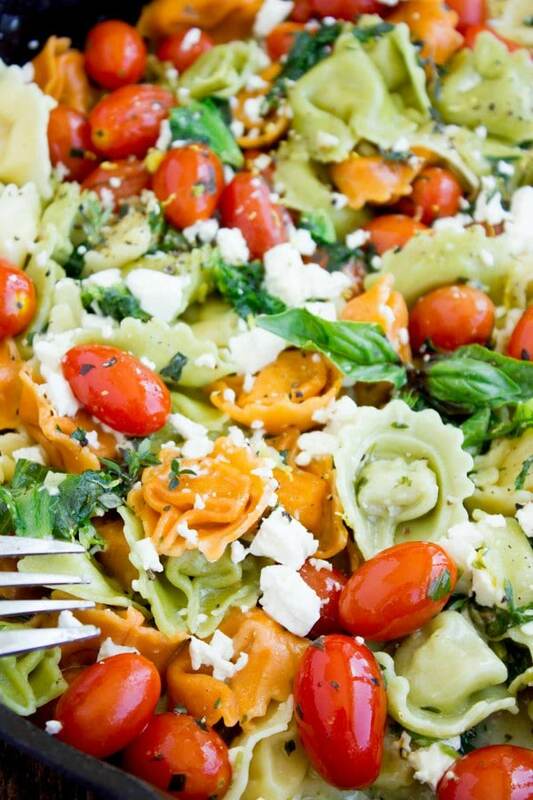 I love feta in my pasta, and this recipe is a family favorite! Such an easy, fast and scrumptious meal that’s just perfect for Spring! 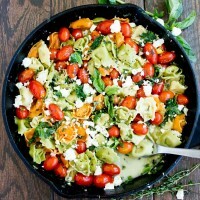 The bright colors of the veggies with the colored pasta is so eyecatching. Cannot wait to make this. That mix of flavors in incredible! I can literally feel the excitement this meal brings with its looks! And the fact that you can whip the whole thing in 10 minutes is priceless!